Designed for use on portable straight-line finishing machines operating at 3,700 RPM or slower. The tools are designed for fine finishing applications, as well as creating a linear scratch pattern on a surface. (examples include tank finishing, or finishing stainless steel counter tops or food processing equipment). These will fit tools sold by J. Walter, Metabo, and Dynabrade. 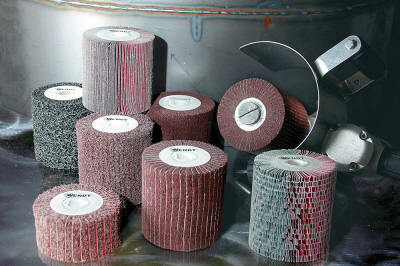 Interleaf Flap Wheels - Alternating layers of abrasive cloth in various grits with maroon nonwoven finishing material. Used for light stock removal and deburring. Nonwoven Finishing Flap Wheels - Made from nonwoven finishing material in various grades. They are designed to enhance the finish without removing stock. Click here for other nonwoven surface conditioning products. The flap wheels listed below are all 4" long. Some wheels are also available in a narrower 2" length. Contact us. Download a printable page.